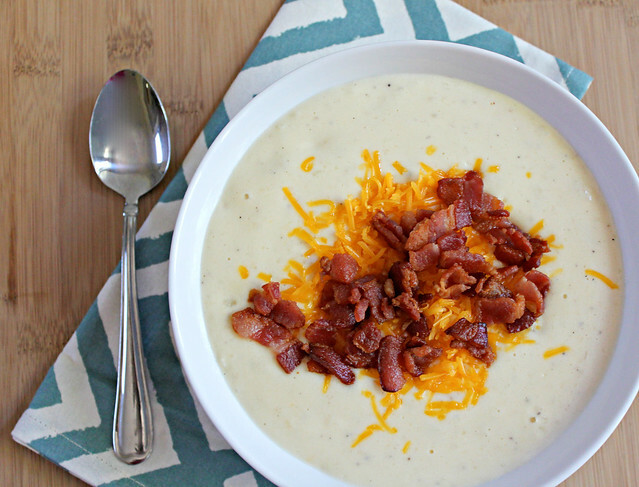 I baked the potatoes the night before and fried the bacon the morning we were to have this soup in order to cut down on the amount of time I was in the kitchen at dinnertime. As a result, the soup came together in less than 30 minutes. Preheat the oven to 400 degrees F. Line a cookie sheet or large pan with aluminum foil. Pierce potatoes with a knife or fork. Place potatoes on pan and bake for 45 minutes to an hour or until potatoes are tender. After potatoes have cooled, peel and place them in a medium sized bowl. Coarsely mash potatoes and set aside. In a large soup pot, add the flour. Over medium heat, slowly whisk in milk until smooth. While whisking often, cook over medium heat until thick, about 8 minutes. Add potatoes, cheese, salt, and pepper. Stir until cheese is melted. Stir in sour cream and green onions and cook on low until soup is heated through (do not boil). Serve topped with bacon, cheese, and green onions.